China said Wednesday that the Philippines is violating maritime law by claiming a shoal in the South China Sea and dismissed Manila's request to take the dispute to an International Court. "We believe it runs counter to historical facts and violates the law," said Liu Weimin, a spokesman for the Foreign Ministry. 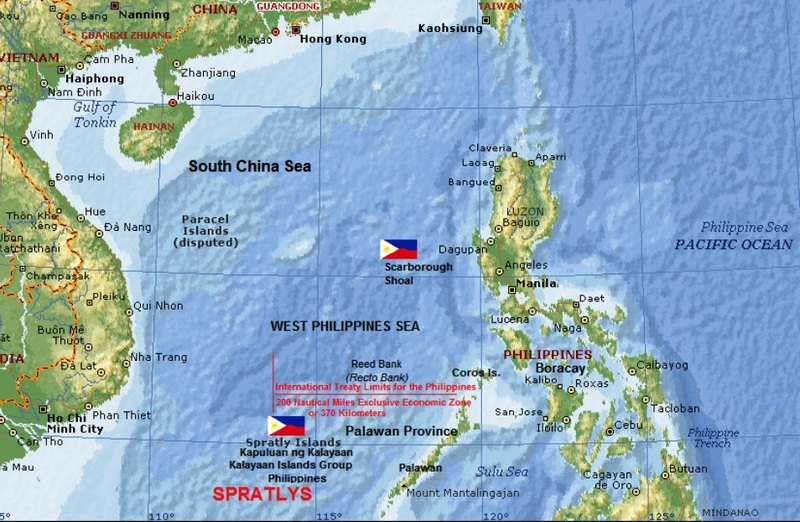 Philippine navy and Chinese maritime patrol vessels engaged in a standoff last week over a fishing incident near the Scarborough shoal in the South China Sea, an area both sides claim as sovereign territory. Liu said China had "lodged solemn representations" with the Philippines and that Fu Ying, a vice foreign minister, had called in the Philippine envoy on Wednesday over the issue. The Philippines plans to seek resolution in an international court, arguing that the shoal is well within the country's 370-kilometer (230-mile) exclusive economic zone that is recognized under the U.N. Convention on the Law of the Sea. Liu said the Philippines is violating international law by using the U.N. convention to call into question sovereignty over the territory, known to china as Huangyan. "China has sufficient legal evidence for its jurisdiction over the Huangyan island. China was the earliest to discover and name the island, and has included it on maps and exercised its sovereignty over it ever since," Liu said. 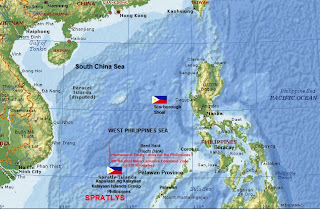 Liu said that the Philippines never objected to China's territorial control of the shoal before 1997 and that its claim now is "completely baseless." A Philippine government statement on Wednesday contradicted Liu's remarks, saying it has effectively occupied and exercised jurisdiction over the shoal -- which it calls Bajo de Masinloc, or Panatag shoal -- for decades. 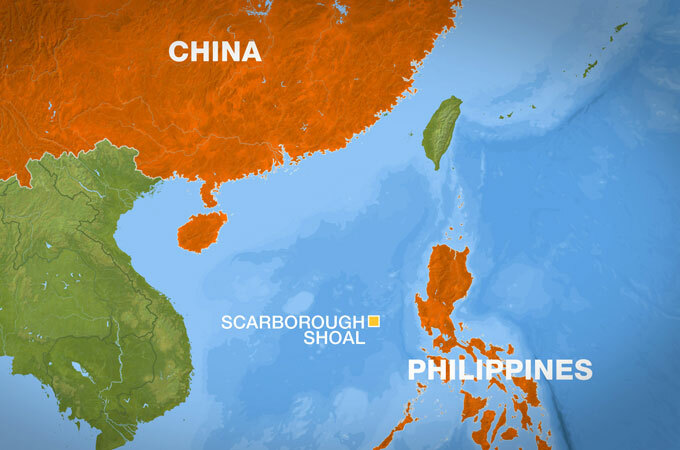 A map published in 1734 showed the shoal was part of the northwestern Philippine province of Zambales, the government said, adding that a Philippine flag and lighthouse were erected on Scarborough islets in 1965. U.S. and Philippine warships engaged in defense exercises at the shoal when American forces maintained a naval base in Zambales, the government said. The shoal "is an integral part of the Philippine territory" and Chinese vessels in the area are committing "serious violation of the Philippines' sovereignty and maritime jurisdiction," it said. The shoal is among numerous islands, reefs and coral outcrops in the South China Sea claimed by China, the Philippines and other nations for their potential oil and gas deposits, rich fishing grounds and proximity to busy commercial sea lanes. The controversy flared on April 10 when two Chinese ships prevented a Philippine warship from arresting several Chinese fishermen who were accused of illegal entry and poaching. The fishermen slipped away from the shoal over the weekend, angering Philippine officials. Manila lodged a protest with China on Monday, accusing one of the Chinese ships and an aircraft of harassing a Philippine-registered yacht that was conducting archaeological research in the shoal. Liu said tensions started to ease after bilateral talks. "We hope that the Philippines can stay with their commitment and pull back their ships as soon as possible, and resume peace and stability in waters near the Huangyan island," Liu said.